As you can probably tell by now, I love to play dress-up. So whenever the theme of the party/ event is to play dress up, I will go out of my way to dress up according to the theme. And at times, I went overboard with it too. 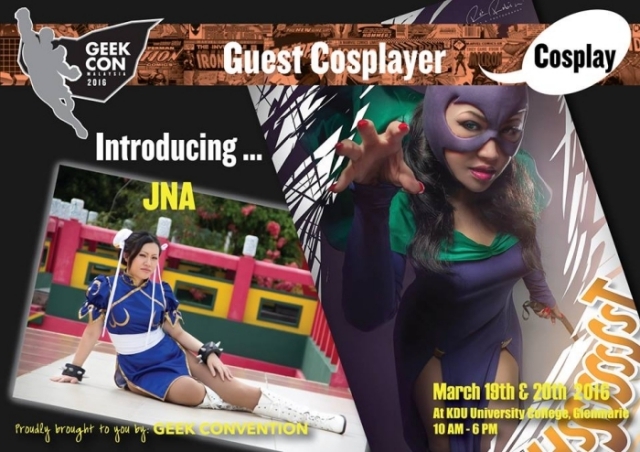 So, imagine my reaction when I heard that Metro.Events is bringing Geek Con Malaysia 2016 to KDU University College Utropolis Glenmarie Campus from 19 - 20 March 2016!!!!! It is time to show your inner hero/ villain! With a tagline of "Bringing geek culture to life! ", it will showcase a super-impressive lineup of exhibitors, activities, contests, and guest appearances. 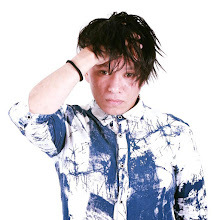 Multiple award-winning hip hop artist Point Blanc will be the event emcee and the venue will also be graced by the presence of top cosplayers such as Misa Chiang from Taiwan and Malaysia's very own Jna and Chineko. Furthermore, Metros.Events will be at Geek Con to give a few visitors some Metros.Events freebie packs. And, Metro.Events also have a contest in store for all of us who love to dress up for the occasion - a COSTUME CONTEST! 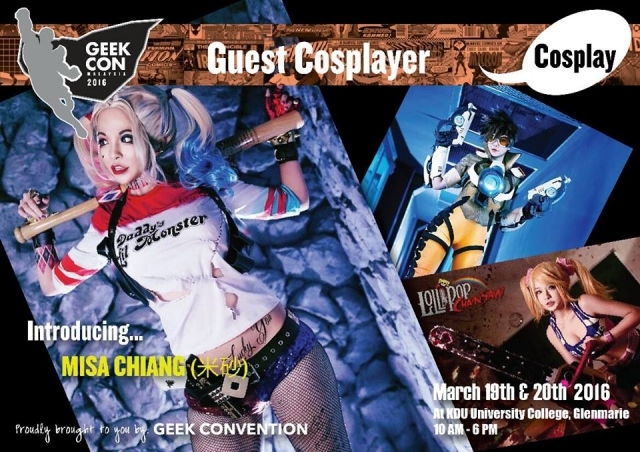 All you have to do is head early on to KDU (Glenmarie Campus)W in your best cosplay costume, let the organizer take individual photos of you and check out their Facebook Page on 21 March 2016 to tag yourself and get your fans and friends to LIKE the pic. Force them if you too! The two individual photos with the most 'Likes' wins! A Funko Pop! toy (either Batman or Superman -- the one with most likes gets to choose which one) sponsored by Bricksmore, your go-to shop for Funko Pops that have one of the largest and widest selections and great promotions from time to time. RM50 voucher from Tony Roma's. Legendary for Ribs. Famous for so much more! Check out their new 'Spice It Up' menu. Two (2) Golden Screen Cinemas GOLD CLASS tickets which are valid until 8 September 2016 (also applicable for GSC MAXX, Dolby Atmos, and D-BOX). And don't forget to submit your review on the event and movies so that you could join in the new redemption program. 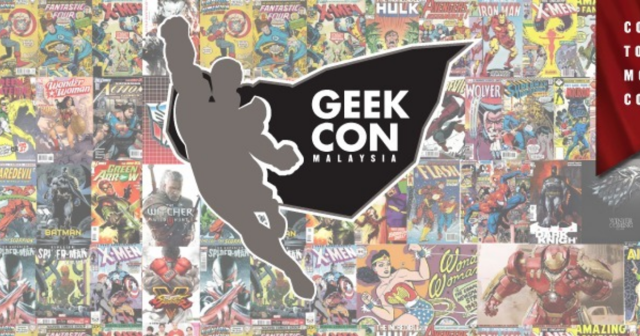 So, don't forget to come to Geek Con Malaysia 2016 for a fresh dose of 'nerdgasm' and a chance to win prizes from us! See you there - Superhero or Supervillain. Head on here for more info. Ah, what a colourful event this will be! I can't wait to see you in superhero costume! Monday, 21 March, 2016 delete This comment has been removed by the author. Cosplay event is so much funnn right?!!! Wondering how's your superhero costume! How was the event? What did you dress up as? Sounds like a lot of fun!! I for one find it super interesting seeing cosplayers anytime... anywhere and this should be lots of fun!!! Did you dress up in your superhero costume as well as cant see your photos here. aiks, missed the chance of participating in the contest. but i love the overall idea, seems really interesting! hope they'll have more like this in future. This seems to be something different than the usual. Waiting for your one more post to elaborate the details of this event. Colorful and Fun event for cosplayer I guess? hehe Did Rawlins joining the fun of cosplay juga ke? Not really into cosplay but is fun to see someone cosplaying! This will be the cosplayer heaven. 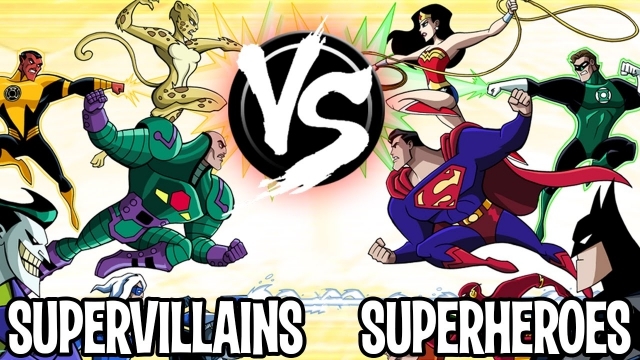 Superheroes vs Supervillian who will win? Am I too old to join for this contest. Haha. Nowaday, a lot of contestant is so creative and I salute their braveness. By the way thank you for sharing this. Oh nice! Have always admired how cosplaying is done - it definitely takes a lot of effort for an outfit or look to be done so the appreciation of the work is always there. This is a fun way to showcase I suppose but hope you had fun at the event! My Fish or My Kids?